Home » Job Spam: 6 tip-offs save you hundreds of hours! 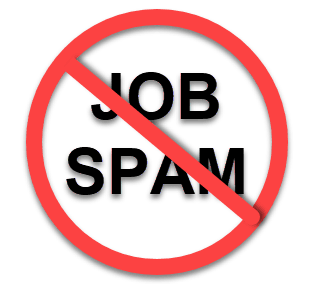 In the July 25, 2017 Ask The Headhunter Newsletter, a seasoned reader recognizes job spam and deletes it. I just received this URGENT OPENING from a recruiter I don’t know. I’m in Silicon Valley with a real job. The contract position is in North Carolina. Now I realize how many hours I’ve wasted over the years, responding to job spam, filling out forms, doing phone screens, even showing up for interviews — when I should have realized I was being jerked around from the start. (I even got scammed on an airline flight I paid for without getting reimbursed.) The worst of it is the anticipation and wasted energy expecting something to happen! But these e-mails keep coming, with barely a few legit ones every now and then. You must have some way to quickly pick the ones to ignore. I’d love to hear your tips! You can save lots of time (and frustration) by checking those e-mails for the tell-tale signs of job spam — also known as drive-by recruiting. Don’t become just another victim by responding when you should hit the DELETE key. Thanks for sharing that e-mail. I’ve redacted the names so we can take a look at it. I’ll show you want to look for. You’re not being recruited. You’re being asked to apply for a job. This is not a recruiter. But this is not a recruiter. 2. 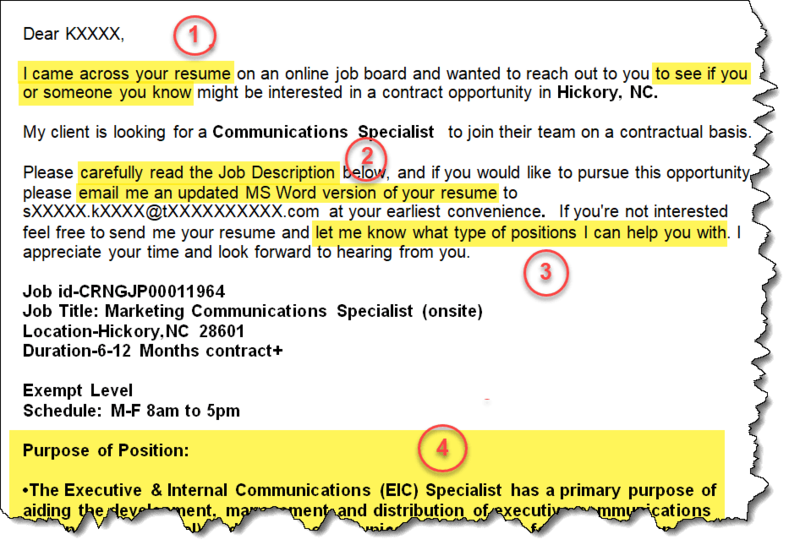 The second tip-off that this is job spam: The sender wants you to “read the Job Description.” Say what? This guy wants you to do the work of matching yourself to the job! He has no idea whether you’re a match, or whether you and his client have any reason to talk! He has sent this mail to hundreds if not thousands of people. And if he found your resume online, why does he need “an updated MS Word version?” If he’s coming after you for this job — that is, actually recruiting you — then he doesn’t need another version of your resume. He’s sucking you in by making you take an action while he does nothing at all. In case you don’t realize it, this e-mail has all the impersonal hallmarks of a mail-merge from a database. This guy doesn’t even know he sent it to you! If you respond, next you’ll rationalize why you’re wasting your time sending him even more information and filling out job application forms that a real recruiter does not need. Then you’re hooked. Then you’ll write to ask me why you’re not getting responses to your follow-up e-mails. 3. He’s not really a recruiter. When a recruiter or headhunter tells you he’s going to “help you” with “positions,” run. He’s telling you he’s a phony. Real recruiters and headhunters find people for specific jobs. They don’t help you find a job. 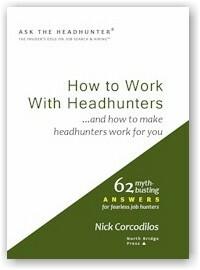 (See Headhunters find people, not jobs.) While a good headhunter may remember you for a job that comes along later, this come-on is the classic sign of a quack trying to get you to respond to spam. 4. You’re a number. Just like the “Job id” in the e-mail, you are a number in a database. A real headhunter would never say he’s recruiting you for “Job id-CRNGJP00011964.” How impersonal is that? Gimme a break. The purpose of this mail is not to recruit you. It’s to make you read a database record. This guy has no time to discuss the job with the 2,000 people he’s sent this spam to. He wants you all to read it while he has lunch. I’ve cut off the rest of his solicitation — but it’s 469 more words he wants you to study and check off before you bother him. Now we get to the insult. This guy needs to fill a job fast to make a buck, and he’s made that your problem. Er, “opportunity.” So sit up and beg, and do it fast. A real recruiter is worried he’s going to lose you. He’s not going to threaten you — not any more than you’d threaten the person you hope will go to dinner with you! But the real tip-off that this is a worthless drive-by recruiting e-mail is in what it doesn’t say. There is nothing personal in the closing. There is no effort to demonstrate a sincere interest in you. This is a cheap salesman telling you to apply for a job. You can do that on any job board without being insulted. Now for the piece of resistance, the drop-dead, in-your-face, no-question tip-off that this is junk mail — not anyone recruiting you. 6. This is job spam. We know it’s spam because of the opt-out section at the end that’s required by the CAN-SPAM Act. When’s the last time you saw this at the bottom of a legit e-mail? Desperate job hunters want someone else to find them a job. They engage in wishful thinking — and get suckered easily by spam like this. There is no recruiter behind that mail! That’s it. Would you call me back? That’s not what those e-mails say to you? Please. Get real. How many hundreds of hours will job seekers waste responding, sending information, filling out forms, waiting for feedback from junk mail? It seems you have finally figured it out. My compliments, and many thanks for sharing this example of cheesy “recruiting.” I hope these tips wear out the DELETE key on everyone else’s keyboard before thousands or millions of hours get wasted on job spam! How do you know it’s not a real recruiter? What tips you off to job spam? And what kinds of embarrassing time-wasters have you fallen for? Don’t feel bad — please share so we can all learn how to avoid getting suckered! Not to forget: “…or if you know someone who is looking for a job and may fit the described role…” I’ll get a referral bonus, though. I can get paid to do your job?! Sign me up! I have patented DNA and medical devices for years and know next to NOTHING about corporate. I’m all patents. Yep – getting too many of these recently. And in my thoroughly non-scientific analysis, it appears that while Nigerians have nothing but princes wanting to give me money, it seems to have fallen to India to become the job spammers of the world. I did get suckered into one of these because the position truly was interesting, so I went along until I refused to give my Skype ID (don’t have one) and my SSN! I explained the SSN was something I would give the employer after signing the offer and filling out my tax paperwork, but not until then. Strangely, I was no longer a fit for the role. Run like the wind. You’re wasting your time with an Indian recruiter. These days, Apu has been reduced to hawking openings at TCS, Wipro, HCL, & Infosys. That’s all that’s left for these scammers to pitch. Recruiting has become a vector for identity theft. The scammers love it because everyone wants a chance at a great new job — they’ll deliver the info. People still fall prey to phone calls from the “IRS” threatening to put you in jail if your don’t pay immediately. Have also seen fake FedEx and Amazon emails with creative subject lines and text trying to make one believe they need to resubmit personal financial info due to an “update” or other “problem” with and order. There was even a recent article in AARP about a new twist on the time share resale scam which netted the scammers somewhere between $10-20 million and including a few thousand victims. Yes, scammers posing as recruiters for the purpose of ID theft is likely to fool many people who refuse to take the drivers seat and interview the “recruiter” FIRST before giving up any info. Seems the temptation of being first in line with the inside scoop on a new “opportunity” is just to much for most to resist. Filter these into the Junk folder where they belong. Also, anyone who addresses me by my full first name, (which not even my parents use), instead of my nickname does not know me and gets the same treatment. A buddy of mine named something else uses the name Zeke on all forms, then he tracks the resulting spam. It’s staggering. I see the converse of this email quite often in my work inbox. “We have these highly qualified C++ and J# Developers!! !” I might have the descriptions wrong, I’m not a developer nor have I ever hired one. If there is no opt-out link, I add the sender to the “permanently delete” rule. They stop writing! No, it won’t make me miss real opportunities. Sometimes I do decide to have fun with them if they write back after that statement. Recently, someone did write back. She had disclosed the salary range which was actually decent. So I inquired further and asked for the employer. She said I need to give my resume to her first. I said not unless I know who it’s going to. It was for a previous employer – different division completely. So I gave her my resume. Then I never heard from her again after she said said she got my resume. Next time: No resume no matter what. These never end well. Just some clarification: My current position is with a company that I specifically targeted when I found they were local. I already knew two people, so when positions opened up, I applied. I think I applied to 2 or 3 different positions. I have been with my new company over a year. I went through their online application system and didn’t even fill out some of the information – I wrote “see resume.” I was well qualified for the position, and they really wanted me. My previous position was acquired through a personal contact (actually someone I used to date with whom I have remained friends throughout the years and who thinks my wife is the right person for me). That job worked well, but it was a very small company dealing with a changing marketplace. I would have stayed otherwise. Finally, every job I have had started with some action by me – I was never “found.” Likewise, accepting a position has always been my choice. The difference between employers/recruiters who really want YOU and the rest of them is night and day. 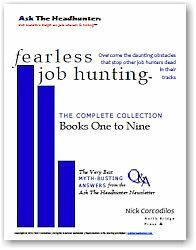 “The rest of them” are the reason for most of the frustration in job hunting — you get abused because there is no recruiting going on, they don’t really want you, and they don’t care. 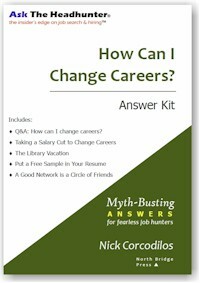 If job seekers would think hard on just that one fact, everything in the employment market would change. Indeed and LinkedIn would go broke. Employers would stop outsourcing recruiting. The talent shortage would end. Half of all managers would be fired because they don’t know how to recruit and hire, and they don’t know how to train and develop new employees. Those two facts (1. many managers don’t know how to recruit; 2. don’t know how to train and develop) of which I reminded poster “Liz” of in your last blog got serious blow back from clueless and angry posters. As long as weak HA/Ms continue to allow HR and the like to take over their responsibilities we’ll continue to see the disintegration of the hiring process and idolizing of job boards by job seekers with their heads in the clouds. Is it any wonder people continue to respond to scam emails?!? I could not agree more! HR expanded its role to a point where they write the job descriptions ‘recruit’ the talent. (Troll Indeed.) Interview and hire. 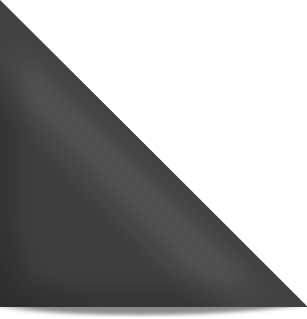 Promote, fire – even training. Just because they know nothing about the actual skills needed except the names of the skills (Do you know SQL?) matters not. A good manager knows how to work around HR. 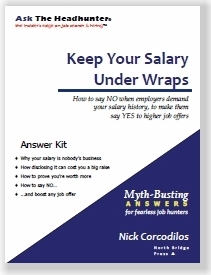 As does a good job seeker and Nick has a lot of great advice and thoughts on that! Even some of the larger national recruiting agencies are pulling spamming crap. Recently one presented several positions, so I picked the ones I felt would be a good fit with my experience and skills and emailed them back. The recruiter replied back, that she had already applied to all of them. Great – I am sure I will be getting a call back now – NOT! On a larger issue, I am so sick and tired of hearing about the skills gap. At my local church I was speaking with an older gentleman who is having trouble finding work and keeps hearing that he is “overqualified.” As has happened many times before these groups keep growing as people pass by and say something along the lines of, “…my relative/self/friend is having the same problem” until the group is absurdly large. From what I have seen in the job market, companies have lost their collective minds. People are having trouble with the over qualification b.s. as young as their mid thirties? This is just ridiculous! This is a part of the employment crisis that isn’t getting much play. Companies are using technology to dumb down jobs, so they really don’t want people who can or will think for themselves. Thus, the overqualified message many are hearing. You see it at companies like UPS where they have been investing in technology for over a decade to make it so that any schmo off the street can pull a route just by following the computer directions. Without it, it takes months to years of experience, and a lot of know how before a driver is reasonably productive. So, they aren’t going to want those smart knowledgeable drivers because they command too high of a wage (i.e. are ‘overqualified’). This is happening in almost every industry and is one reason why we aren’t seeing wages grow despite the ‘talent shortage’. One justification for rejecting the “overqualified” is the “you’ll leave as soon as something better comes along” excuse. Well, D’UH, who wouldn’t? Who says, “Wow, $8/hour, I’m set for life here!”…??? I’ve always felt people that used “overqualified” to reject people are generally clueless on how to properly use/develop/retain employees. Any person with any sort of ambition/skills is going to become “bored” with the specific job at some point, and they are given no compelling reason to stay. ‘Talent Shortage’ hahahahah! This is another part of the puzzle. The companies can scream for more H1-B Visas. They show all these ‘attempts’ to find ‘talent’ and whine the talent can only be located in Laos or North Korea. Soon Jeff Bezos will have 80% of the US GDP under his thumb and we will all be automated out of our jobs anyway. Wages not going up is a clear sign that the job market is not healthy as is the large number of people who are not in the workforce. I am somewhat suspicious of the supposedly large group of people not looking for work, as I know some individuals who had to fill positions at small companies that do not use outside recruiters or software to screen applicants. All of these hiring managers were slammed with thousands and thousands of resumes. Recently a large bank hosted a job fair to hire for their call center and when I drove by the mall where the event was hosted, the line to get in wrapped around the mall. If I had to guess I would say there were approximately 200 people waiting to get in about an hour before the event. But yah, they can’t find workers – right! Ignore the first email or call. Anyone genuinely interested will contact you again. Sometimes a call or email will get lost. A genuine head hunter will try back one more time to contact you. Heh-hey, Tony. That’s very true. A very simple rule to follow. It’s what I do when I get calls with caller ID I don’t recognize. If they really need to talk with me, they’ll leave a message or try again. People are too tied to their comms devices. All incoming must be addressed. NO, THEY DON’T NEED TO BE. Let it sit and simmer. Save time. Save frustration. VET incoming stuff by letting it prove itself. They’ll call back — or, don’t bother with them. My motto to a tee. Problem is, we have an entire new generation of adults that just surpassed the Baby Boomers in number and they just LOVE to be “connected” virtually every minute of the day. Seems they think being busy means being productive. It’s FOMO…fear of missing out. What a joke. @Chris S: Every generation comes to figure out that the system is screwing it/them. It’s always a little time bomb. Then it goes off. The latest generation will wise up when it gets screwed — and it’s already being screwed. Years ago interviewed at Amazon but there was mutual feeling I wasn’t a good fit. But that has not stopped the job spam from them. They are a little better at making it look legit but it’s clear to me it’s spam and the “recruiters” put no thought into the emails. The reason is I get the same email twice every time they want to me for a new position which is several times a month. I must be duplicated in their recruiting database. I have readers who send me their Amazon job spam almost every day. It doesn’t matter what they do to shut it down — it continues. Once, they sent it to my work email, and I have no clue how they got it as I never used it to sign up for anything. And of course, like BillR, you try to get an invite 2-3 times and are flat out rejected, they keep inviting you anyways. 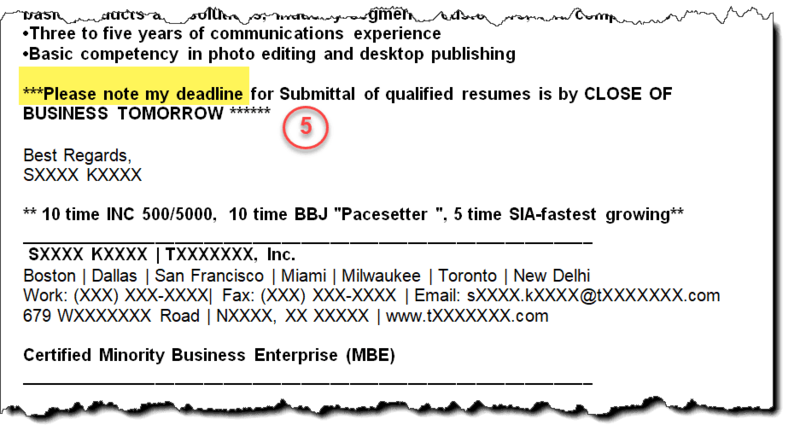 If you have ever posted your resume on a job board (CareerBuilder, Dice, Monster) they got it from there. These job boards sell you information to anyone. It seems they even sell it to one another. I bet Dice has less than 7,600 real jobs posted. If you are finding work from Dice, that’s great. For most candidates, Dice is ground zero for drive-by job postings. But today, most of them are paid by the hour. It doesn’t matter whether jobs get filled. They get paid, and not much. Why do you think you have the experiences you do with most of them. If you’ve learned to separate the good ones, you’re ahead of the game. Here in Boston, the job market has been contracting since the end of 2015. Over the weekend, one Boston-based staffing firm was down to 12 “hot opportunities” for Boston. The collapse of “hot opportunities” has left all the drive-by recruiting firms in the Boston area chasing the same 12 openings, which have been publicly posted for 1 to 3 years. A large number of staffing firms, chasing a dozen non-jobs isn’t a sustainable business model. @Bob: It is if you pay the recruiters peanuts, or if they’re robots. This is not the Information Age. It is the misinformation. Big data and automation are great – as TOOLS only. There is no substitute for the human touch. In my work as an electrical engineer I use the internet to find parts, a SPICE program to simulate (I am an analog engineer with software, digital, and power experience), and email to make inquiries. The creative part – very often selecting the lowest cost components that will do the job or coming up with a particular circuit topology which is fun are fully human endeavours. This is work that needs the human touch. @Kevin: Well said. And more power to analog engineers! (heh heh) Of course, they told us 30 years ago that analog was dead… trouble is, all technology must interface to analog humans. You’ll always have a job, unless all employers become very stupid. You probably own something made by my employer – and we are a very old company, so we must be doing something right. If there were no need for my analog skills, I can always find someone who does. With extensive software, digital, and power experience in addition to analog skills, I can offer a complete design. In my company, I could easily become a cog in the wheel, but I don’t let that happen – for example, I may not write software, but I know what our software engineers are doing. I also work closely with a mechanical engineer. It takes comprehensive knowledge. This is something that takes years to develop. @Kevin: “Years to develop”?? There’s an app for that. We can find 50 of you on Indeed. Just in time analog engineers with comprehensive knowledge. Ready to go. Guaranteed or your money back. Just put in the key words. @Nick. I believe employers are not stupid at all. They are getting American labor for a dime on the dollar and Global labor for pennies on the dollar. Employers are unethical immoral piles of bovine feces but not stupid. @Jimster. Stupid is a function of time. They’ll see how stupid they are when competitors eat their lunch. There are good companies out there. They don’t care what stupid ones are doing. Who oughta care about stupid companies are consumers. In the past, I used to click on the link in the email to be removed from their database…..which never worked. So now, I just fill out the on line form with a bunch of bunk information. Takes only a few minutes, and it’s kind of a fun mental break. Why, yes, I have a PhD in Hypercompunectics and will work for $4.50/hr and will relocate for free! They were kind enough to put junk in my inbox, so I’ll return the favor with junk in their system. I think next time I will google the description, find the employer, and then thank the “recruiter” for bringing the job to my attention…..so I can apply directly to the company (which I won’t actually do). Maybe that will get me off their list. @Chris: I do something similar with spam phone calls when I want a minute of entertainment. I answer, let the robot ask me to press 1. I press 1 and place the phone very close to my desk speakers so they can enjoy Tom Waits doing “Filipino Box Spring Hog” VERY LOUD. They don’t last 5 seconds. Highly recommended. Works best if you start it at about 1:40. We used to get 12 – 15 spam phone calls a day. Then we upgraded to a digital line and got NoMoRobo which blocks almost all of them. One ring and it is done. It is free for landlines also. Saved our sanity, it did. Think I’ll go eat concrete for lunch instead. Heh. The last time I dealt with Comcast was when their cable tech told my wife that we shouldn’t expect all our channels to be clear. I wouldn’t buy a coloring book from those turkeys. But you’re probably stuck with them. @Scott: Yep. The only competition for Internet is low-speed CenturyLink, which delivers pizza cold. My town govt is about to renew Comcast’s franchise for 15 years. I was on the committee working on it till the project bogged down… and I quit when I realized it’s because the committee chairman used to work at Comcast. “We have no other choice…” Now they’re lambasting me for lambasting them online for selling us out without even trying to develop options. Meanwhile, my Comcast bill just went up 30%. “Your promotions expired. Want cold pizza with that?” Sorry to vent off topic. But here’s the punchline. The committee chair worked at Comcast in… HR! Slap me, please!!! I just got one of those on linkedin. Haven’t heard anything back, yet. I used to get those emails several times a week back in 2013/14, then they dried up, now I’m seeing them popping up again. A few weeks back I noticed the same job appearing on Indeed through no less than five of these staffing/recruiting/whatever companies. (I always love the generic tech names these places go by: ADPI, DISYS, CUE, TalentBurst, Axelon…reminds me of The Simpsons ep where they go shopping at some cheap electronics store, “Hey, I know a genuine Panaphonics when I see one. And, look, there’s Magnetbox, and Sorny…”) Sure enough, I got an email from one of them. I knew the client was MassMutual (whom I despise), so just for fun I replied saying thanks but I refuse to do business with MassMutual. You’d think that they’d want to know more about my poor opinion of their client and make some attempt to restore their client’s tarnished reputation with me, but, of all the times I’ve sent messages like this I never do hear back. Certainly says something about their integrity, IMO. I received three of these emails last week for the same “urgent position”, two from the same staffing company. The funny thing was on the second email message from the same staffing firm the email was address to “Dear [Candidate Name]” I replied telling them to go pound salt and signed it “Best Regards, [Candidate Name].” It is pretty sad when they cannot even add the recipient’s name to their form spam letter. Nick, I forgot to tell you when we spoke on Sunday evening, that I enjoyed your snarky replies from last week’s newsletter. Keep up the good work and providing good laughs. Thank you for all of the help you have provided over the years in my job searches. Thanks, Kevin. Just remember. Every personal contact that doesn’t turn into a job can become a friend. A spam e-mail cannot become a friend. Friends lead to jobs, even if it takes time. I signed up with every single recruiter in MA (in hindsight, not my best idea) and weeks later received the same job opportunity from all of them. Had to laugh, apparently there was ONE job they were all chasing. For a Business Intelligence company, the company offered a high level view of other candidates for a mid level finance position. 12 individuals had applied from top 10 MBA programs and 3 PhDs. Going to take a while to pay off those student loans working a job that offered 70k a year. I’ve used some mass mailing programs for the conference I’m involved with, and this line is required by the programs for all mail. The programs add people who opt out to a list – though it is easy for a spammer to ignore this. So it also shows up for legit mails – but is a sure sign that it is a mass mailing, not a personal mail. But like you said it is pretty clear that there is nothing personal in this mail, and so I’d delete it before I even reached the bottom. There’s not a legit recruiter or headhunter who sends the same e-mail to more than one person. I’m going to start sending job board spammers a link to this page. Maybe there’s hope for a few of them? Just this week alone, I’ve received a TON of “offers” that would put me in places like California, New Jersey, Michigan, etc. – when what I really want is either remote work or a job along the seacoast in Maine. Otherwise, I’m more than content to stay where I am. And on top of that, most of the positions they send are network engineering positions. I’m a cyber threat analyst. Due to the colleges selling all the degrees they can, there is a large oversupply of highly trained people, so the overqualified for young people is fairly common. Well, I’ve heard it said that bad breath is better than no breath at all. I don’t get any job-solicitation emails or phone calls at all – ever. Recruiters never get in touch (nor headhunters or hiring managers). People I meet and occasionally network with never get in touch, never mention an “opportunity,” never suggest I contact someone. I’m so lonely, so cut off, so miserable. Sometimes I have to tie a pork-chop around my neck to get my dog to pay me any attention. Is it possible I’ve died and don’t know it? These days, I either tell them I turned in my dance card. I’d hope that anyone wiht even half a brain can figure that out. Here is the other side of the coin which underscores the broken system. @Currin: Yah, how about that. The deliverable is good hires. The payout is for filling the database. And some chide me for lashing out at HR? Why aren’t those recruiters paid only when jobs are filled and the new employees are successful at work? I was let go from my job in late winter this year, so I’ve been job hunting. I responded to a position for an executive assistant, for which I was over qualified but I need a job. I met with the recruiter who said I had most of what they wanted but that I did not know enough about Excel. She was going to send me a link to a tutorial so I could “get up to speed.” Even though I know Excel, there were a few things I had not done but could learn how to do. Never heard from her again. I wrote her an email thanking her for meeting with me and when should I expect to hear about the position. I would love to name the recruiting agency in this post, but I better not. Regarding clueless companies–I had two interviews with hiring managers, one with a well known company and one with a small non profit. I was qualified for both but never heard back, even though I expressed interest in the job. Both were paying below market value for a project manager ($45,000 up to $60,000). They wanted someone PMP certified, which I am. The job with the well known company wanted a project manager who would handle 10-12 small projects or 6-8 medium projects or 3 large projects each year. The non profit wanted someone who would work on several educational projects and conferences throughout the year. I suspect they will hire someone who is not certified so they can pay less. What I wanted to scream to these hiring managers is that you get what you pay for. I know people who do project management and get paid around $85K and up, more if they work as an IT project manager. Last time I looked, both jobs were still posted. dlms: I recently saw that same job for which I was qualified after 3 months of having it disappear from the job boards. I was turned down with a “you do not have the qualifications…” reply. BS.Yes, my degree does not match the desired degree. But I was the sole inhouse patent guy for a biomedical engineering company. I even told my last company that I didn’t have an engineering degree- my background was biotech. The VP replied “Yeah, but you’ve shown youre hardworking and very intelligent.” I was hired and we had a successful stint for several years, IP-wise. The other company let perfect ruin good. I will one up you guys. I applied for a job back in Mid May at a small software company (50-100 employees), Systems Administrator to be exact. They also had a posting for a Network Admin as well. They called me in for an interview with the IT Director and two of his minions. The IT Director said that his two minions were leaving, and he was looking to replace them, and was willing to tailor the positions to who was available (i.e. one SA/one NA, senior guy/junior guy that would cover both, etc.). I assume that since he had no one else to fill these roles internally, he had motivation to interview/hire quickly. I thought the interview went well, and I even showed one of the interviewers a more efficient way on how to do something. A few weeks later, the 2 jobs are taken down and a job is posted for “IT Director.” I do not know if it is for the “boss” I interviewed with, whether he left or was promoted, etc. Then the 2 jobs re-appeared, slightly tweaked. So eventually this week, I said, what the hell. I’ll follow up with them yet again saying that I had final interviews with other companies and was still waiting to hear back (truth) and that I would rather work for the company in question. I get the classic “you are no longer being considered.” I followed up, respectfully asking for feedback and heard nothing. (b) I also can’t imagine that everyone that has applied is so retarded that they couldn’t be hired or that if they had to hire someone more junior, that they couldn’t start figure things out over the last 3 months. (c) It looks bad that basically the whole department is being hired and this isn’t a brand new department. Maybe they are too embarrassed to admit to this when asked for feedback? (d) With social media as well as my personal network, are they not concerned that I could poison the well so to speak on my treatment? @Faithful Reader: This is easily explained if we posit one thing – the company’s management is a mess. Then it all makes sense. Then add in, they couldn’t care less about job applicants, and they’re too messed up to bother worrying about their social media reputation. You wouldn’t be poisoning their well. You’d be saving others from getting poisoned. Most of what passes for hiring these days is really just “tire kicking” which is probably what they’re doing. I applied for a job back in May, in early June I noticed someone from their corporate IP address visited my website/portfolio. Then the hiring mgr snooped on my StinkedIn profile (gotta check out that profile pic which is so much more important than qualifications!). I never received an invitation to interview so I wrote them off. A month later, I caught them visiting my website again, and I thought wow, they sure are taking their time. Again, no invitation to interview came so I dismissed them. Today they viewed it yet again. So, two months in and they still haven’t made up their mind on who’s worthy of an interview? I remain confident that I’ll be getting their rejection email one of these days (and I question whether anyone will actually get hired). I think the company I am referencing above may have snooped on my website at least twice, because I have a log analyzer and Google Analytics loaded up on my site. First, congrats on following up. However, I’ve learned to avoid HR at all costs. Seems they’re just a watered-down legal department these days staffed by drones who robotically repeat sanitized statements. Sounds like a toxic environment just waiting to devour another newbie victim. As I recently stated elsewhere in this thread, many drones are hired by the master drone of them all – HR. And do I dare state that many HA/Ms are rapidly turning into remote drones themselves. Hilarious and TRUE. Real world experience is apparently now seen as a negative. Many of these Millennial managers just can’t translate the real world into a metric that gives them the warm-n-fuzzy. Reminds me of the time I spoke with a construction Superintendent with decades of trade experience retelling the story of a Millennial college grad expecting a company car, management role, and high salary – right out of school. Some of these guys may be up to something more sinister. They can try and get your info only to then ignore you but use your response or whatever to claim that they couldn’t find any qualified Americans so that they can get then get H1B visas. Wish there was an edit button. Anyway, I got such an email as you described where some IT company that was in two places, one in VA and one in Indianapolis and said they found my resume and suggested that I check to see if I or someone I know would be a fit or something. (It seemed weird.) Anyway, I did write back (just for the heck of it) and never heard back. When I asked some people in IT what they thought of it, some thought it might be some Indian guys (name sounded Indian) (even though the company was American) hoping I’d reply so they could collect my info to claim that they couldn’t find any qualified Americans so that they could get more H1Bs. @MongooseLover: There isn’t an edit button (yet) but there is a Preview button that gives you some leeway while posting a comment. I know it’s not the same — sorry! For those companies who keep bringing in candidates to interview, rejecting those candidates, and so on and so on. What is that costing you in time and effort to keep searching for the “perfect hire”? What is that costing you in work not getting done or done poorly because other employees are trying to juggle their job and part of another? What is it costing you as your competitors move ahead of you? What is it costing you in the professional community as your reputation is tarnished because you drag your feet on hiring and waste talented people’s time? Think about that as you look for your perfect hire. First, how does your company keep afloat without sales coming in? Second, your management may be delaying in hiring sales people because sales are so low (circular reasoning where sales need to be big enough to hire sales prople, but to accomplish that, you need sales people to increase sales). In my current job I am hired in the hardware engineering department, but sometimes we have time on our hands, so I offered my services to the software department. I have also talked to customers with the project management department when we are trying to solve a problem. I would do sales if I needed to and I am sure my management wouldn’t complain if I won a contract. PS: I work for a company with nearly 400,000 employees. So, as you see DLMS, “thinking” is not their strong point. Yet, per the Peter Principle, they rose to their level of incompetence with the side effect of financial damage to the company. Having to clean up after a mis-hire (or two) can be just as much a disaster. Apparently, too many HA/Ms are either “chair fillers” or “purple squirrel hunters” – either end of the spectrum destroys company morale and causes more trouble than the failed strategy is worth. I once turned down an offer wherein the HA/M wanted me to quit my current position (with virtually no notice) and start within 3-4 days. Ahhh, how ’bout NO was the summary of my response. Anyone that desperate oozes clues of worse issues smoldering – just ripe for a blow up. Do you really want to tread in that domain?!? Sometimes dodging bullets is the name of the game. Anyone actually recruiting would see that and fix it – a machine won’t. 2. OEM Sales Leader for a developer of ultrafast fiber lasers, diode lasers and frequency combs. US Subsidiary of a very successful German laser manufacturer. Primary focus of the role is to grow the business in the OEM, scientific and industrial marketplace across North American which includes biophotonics, semiconductor and other market spaces. Work closely with and mentor the Sales team and work with the Scientific team in product development. Residency on the East Coast is preferred. Translation – we want you to sell, be a sales manager, mentor sales people, and drive product development and act as product manager but only pay you for one of these. We want results in North America, but want you to reside on East Coast because we don’t know how to manage employees. Oh – I left off if you try to leave said company they sue you for non-compete, regardless of where you go. In California where I live and work, non-compete agreements are illegal. That is to say, if you leave a company, they cannot keep you from making a living. I have never heard of a company going after someone for non compete breach. Everyone I know is required to sign a non disclosure agreement, but that is an entirely separate matter. Not surprised. Back in the 90’s I was looking at Micron in Boise. Even drove there and hung out looking for opportunities. Micron workers were not a happy group. And the more I asked around the more I noticed Boise is a lot like Denver/Boulder. Everyone loves the area so workers pour in and that = a labor pool to abuse.